Almonds are rich in vitamin E, magnesium, calcium and potassium. 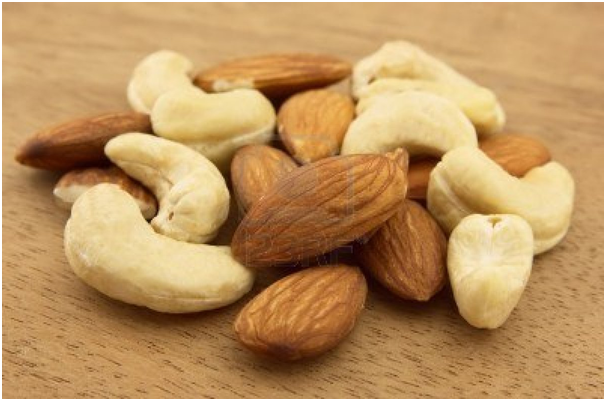 Of all tree nuts, almonds rank highest in protein, calcium, fiber, vitamin E, niacin and riboflavin content by weight. The mono-unsaturated fats, protein and potassium contained in almonds all contribute in heart health. Vitamin E is an effective antioxidant and also reduces the risk of heart disease and the magnesium can help avoid heart attacks. 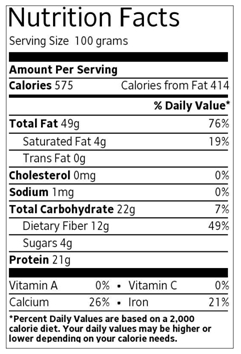 Below is a nutritional label for 100 grams of almonds. Cashews are rich in iron, phosphorus, selenium, magnesium and zinc. They are also good sources of phytochemicals, antioxidants, healthy fats, protein and copper. Cashews also contain proanthocyanidins, a class of flavanols that starve tumours and stop cancer cells from dividing. 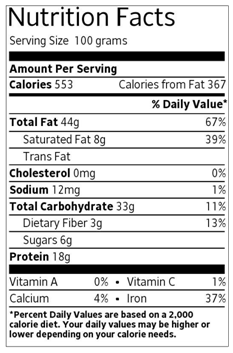 Below is a nutritional label for 100 grams of cashews.